A summer layoff this year mainly owing to our daughter’s wedding – first announced while I was en route to Leipzig on 26.12.98! Life’s partner and I found our various ways to Birmingham Airport (via work in Coventry in my case) for a trip taking in more potential closures in Germany and some cross border lines in and out of the Czech Republic. The Virgin from Hell arrived on time and ran briskly via Portobello Jn and Bescot (despite alleged 5 mph restriction at Bescot notified on the Internet yesterday) arriving at Birmingham Irrational nearly 10 early. It left there on time but was detained by the Lichfield – Coventry (temporary during Proof House rebuilding) local and arrived in Coventry sufficiently late for me to miss the bus by 30 seconds. A lift from a colleague got me to Tile Hill for 1410 to Irrational and a lift from our son took H direct (via an M6 traffic jam) to the Eurohub. BA’s A319 left on time at 1630 and arrived at DUS a few minutes early, providing just enough time to retireve baggage (very quick for once), buy two EuroDomini, get some dosh from the machine, get a Düsseldorf go-anywhere ticket and make the next S-Bahn with a minute or two to spare. The Hotel Fürstenhof proved to be at the opposite end of Fürstenplatz from the tram stop, but only 2 minutes walk. Perfectly adequate Ibis-level establishment. Rack rate DM380, HRS rate DM120, possibly a record so far. We retired by tram and U-Bahn (aka tram) to the Altstadt but decided against eating having (for once) been given something edible (ham and cheese baguette) by BA. Accordingly we had a couple of beers at Uerige and one at Zum Schüssel before setting off back to Fürstenplatz. Although I’d enjoyed Zum Schüssel last time I’d have to say Uerige’s more to my taste. On the tram we sat opposite a couple who had two bottles of Erdinger Weissbier which I admired. When they left the tram they insisted that we had one of the bottles despite strenuous efforts on our part to decline (honestly! There comes a point when it would be offensive to refuse). Upon return to the Fürstenhof the Erdinger rounded off a very pleasant evening. [This was by no means the first time we’ve encountered this sort of friendliness in Germany. As I've noted frequently, I get really tired of the attitude of the British gutter press and its led-by-the-nose readers]. Breakfast at the Fürstenhof featured sausage, scrambled egg and fresh fruit as well as the usual fare. It seemed reasonable to sample the lot… (starts at 0630, for future reference). Off by tram to D-Hbf where 0833 IR to Paderborn and Gera arrived 5 minutes early. By Paderborn the IR was 5 late and causing concern with an 8 minute connection. I was hoping for cross-platform; it was not to be, but we made it by a whisker anyway, thus allowing the physical connection on to the Hameln/Ottbergen line at Altenbeken to be done. At Ottbergen there are no through trains so we didn’t get the connection on to the Northeim/Göttingen line as we swapped 612s. The pair of units proved to be for both Northeim and Göttingen, dividing at Bodenfelde so that solved another problem by the application of the ‘any part of the train’ rule. At Göttingen some lunch in a bun was procured and we left the bags in a locker while we went in search of liquid refreshment (in fact there’s a nice bar on the station but I wanted to see a bit of the town!). A brief visit to the Altstadt proved worthwhile, quite attractive and a number of ‘sit outside’ opportunities one of which provided Paulaner weissbier for a staggering DM6. Nice, though. Onwards to Leinefelde in a tilting thing - 2x2 with failed air conditioning in the front one. Fortunately H was bright enough (unlike me) to realise the rear set might be OK, and she was right. At Leinefelde a 772/972 were waiting, showing Worbis as the destination, but both yellow sheet and gripper confirmed Teistungen and so it proved. 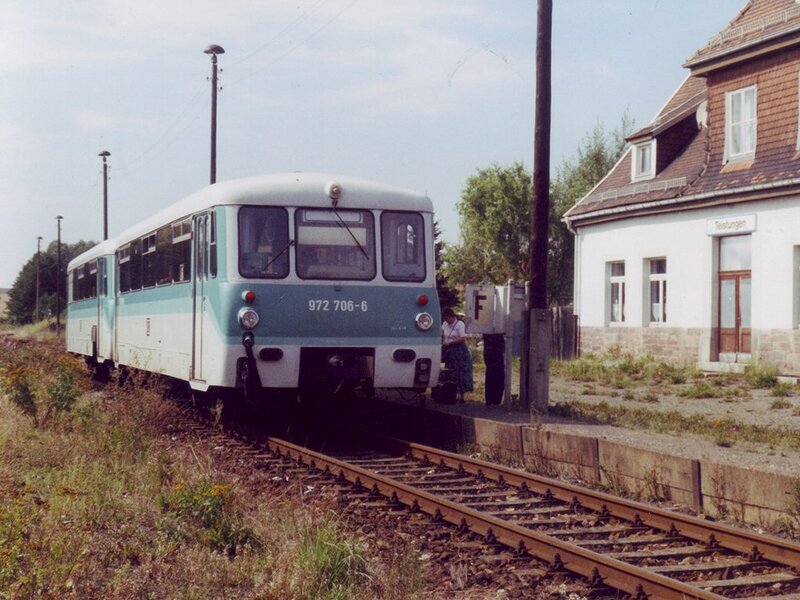 A very nice little branch, which used to go through to Northeim, with no trade beyond Worbis and very rough track. Intending gricers should not delay. Back at Leinefelde we were a couple of minutes late, necessitating a mad dash through the subway to P6 for the Nordhausen train. 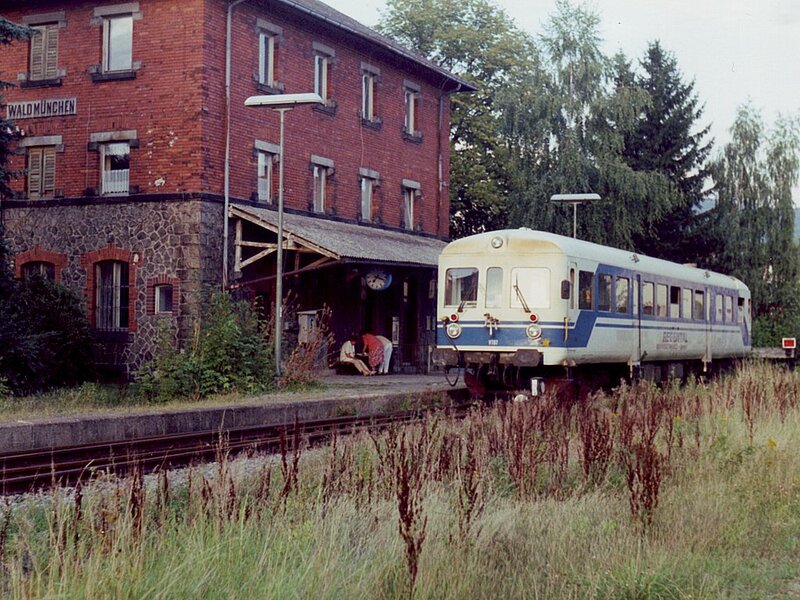 This took us to Bleicherode Ost where the last Großbodungen train of the day was waiting in P3, the south side loop. The branch diverges on the south side and then crosses the main line on an overbridge. Another very pleasant line, not as scenic as Teistungen but with a reasonable load factor all the way. This service (arr 1659, SSuX) is the last of the day and presumably carries commuters. The Ferkeltaxi was a 771 with the usual Italian and Russian notices. The track was noticeably better than Teistungen, but with a very sparse service (5 each way M-F only) beyond Bleicherode Stadt, who knows. At Bleicherode Ost the yellow sheet revealed one daily main line departure from P3 to Heiligenrode, so the physical connection can [dubiously] be considered done. Another electric on to Wolkramshausen where we changed on to the Erfurt line, now provided with nasty plastic 642s instead of the admirable 232 + 4 coaches. Arrival at Erfurt was simultaneous with the 1920 IR to Frankfurt whose 112 was running alongside as we arrived. The IR took us to Gotha where the Thüringer Waldbahn trams run into the town before heading south again. We caught the tram to where the map on the HRS website said that the Quality Hotel was. No sign of it. A passing couple proved both able to speak English and in possession of a street map and town guide (the tables turned, for once). No sign of the hotel but its address turned out to be very near to the station. Very irritated, we got the tram back to the station and a taxi thence to the Q. Hotel which was Ibis-style and absolutely fine. We decided to go for a meal in the town, so taxi again from station to town, a brief wander round and a steak and Erdinger outside the Deli-Späth where the service was willing but oh, so slow. H eventually managed to provoke some activity and after following her excellent suggestion that I locate the tram stop while our meal was being prepared, we caught the 2209 (and last) tram by about 2 minutes. Back at the Quality Hotel (previously known as the Economy Hotel and the Treff Hotel - no wonder no ****** knew where it was), Herself had cocoa and ice cream and I had a Paulaner to finish the day. Quite why this electric loco hauled set was standing at Berga-Kelbra with Kalbe (Milde) as its destination is a mystery. 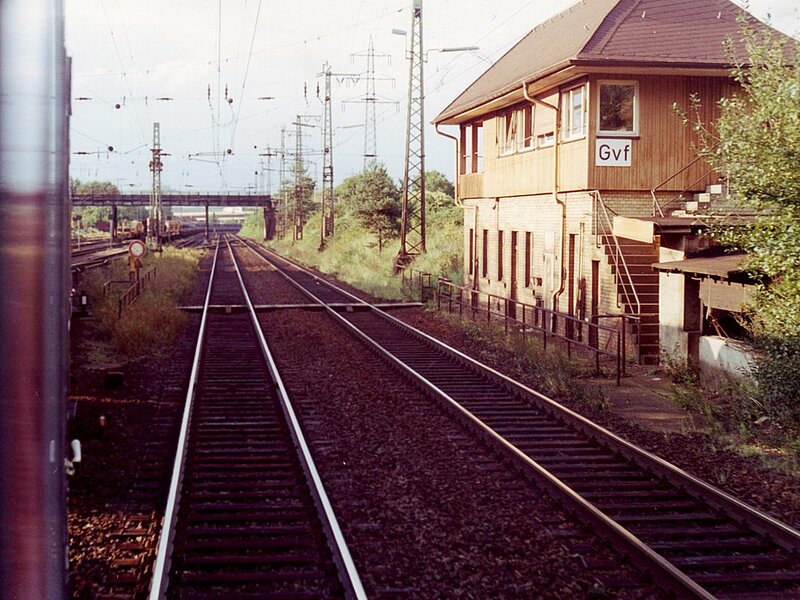 The Kalbe line was closed and non-electrified, and the train was going to Halle! Breakfast (available at 0630) was taken at 0700 and a taxi summoned for 0750. The 0809 to Leinefelde was a 642 which was slung cheerfully about by the driver but even at full tilt (in both senses) was surprisingly comfortable. 5 minutes early at Leinefelde, too. The 0906 Leinefelde - Halle push-pull was showing Kalbe (Milde) on the detination panel, which was novel, to say the least. [It had closed by then.] Worth a phot at Berga-Kelbra where, unfortunately, you can do the physical connection on 0717 SSuO Leipzig - Stollberg and 1802 SSuO return. A 204 was coming off the branch with a 2-wagon freight as we arrived; the branch passenger train was a 612. The branch is pleasant if not exceptional, well wooded as it gets into the Harz area. There’s a very good model shop in the station building at Stollberg, as well as a caff (Ur-Köstritzer, opens 1100) which was duly visited. Back at Berga-Kelbra we caught another electrically pushed RE to Röblingen where there proved to be a caff just outside the station. The continued smoking of the ‘maitre d’’ discouraged us from food and we settled for a Hasserode (a mere DM2) to keep body and soul together. The Röblingen-Querfurt and Querfurt-Merseburg services are now Burgenland bahn using modern low floor railcars. The Man seemed happy enough with our Dominos so we proceeded free of ching to Querfurt. Except for the last couple of miles this proved to be a delightful rural branch which, not surprisingly, I hadn’t spotted at 0730 on 28.12.98! My original impression of Querfurt as a desert appeared to be correct, however. The same Man was driving the Merseburg kart so we were again able to proceed ching-free, The line is mostly dead straight though not level, and not in particularly good condition. In particular there is some very ropey track nearing Merseburg where many connections into various yards and loops have been disconnected. Without knowledge of the deal struck between KEG, DB and the local authorities it’s hard to see either Querfurt service surviving. We had an hour’s break in Merseburg so left the bags and wandered into town where cheese and salami sarnies were procured after enormous linguistic difficulty. What we saw of the town suggested that very little effort has been put in by comparison with, say, Erfurt or Gotha. To my relief the 1609 to Halle-Silberhöhe was booked off P6 (changed from P2 recently) which gave us a chance of the western side of the flyover. The train’s destination panel said Halle-Neustadt but the conductor confirmed Silberhöhe. On departure we charged straight out, too fast for any crossovers, and duly did the west side of the flying junction, continuing via Buna Werke (P1 still out) and the Angersdorf curve to Silberhöhe. We retired thence to Halle-Neustadt (delightful spot) by S-Bahn. The conductor was distracted by a neighbouring passenger’s very friendly dog so I’ll never know if EuroDominos are valid on Halle S-Bahn services. 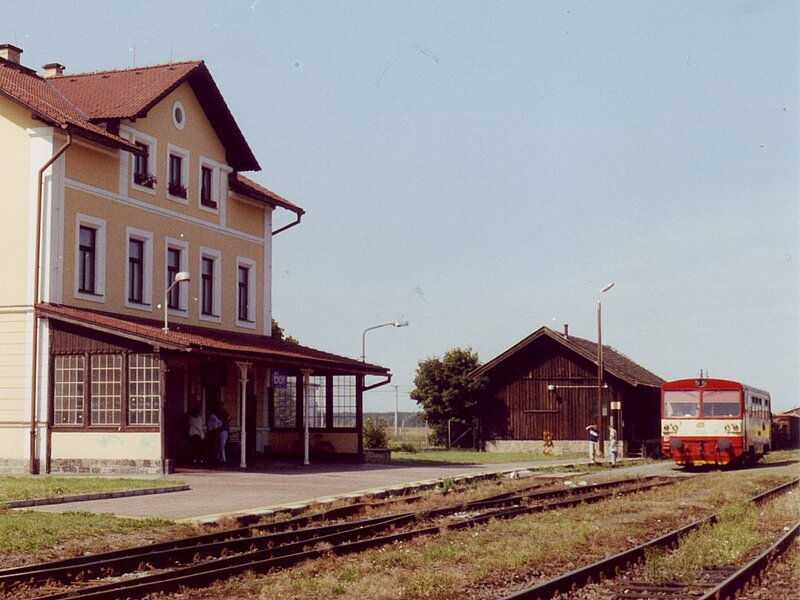 The 1709 Halle-Neustadt - Merseburg turned up on time, causing some alarm when the conductor mentioned Ammandorf. He may have said ‘not via Ammandorf’ but whatever, the train went via Buna Werke thus completing the Halle suburban lines most satisfactorily. The final journey of the day was routine, by IR Merseburg to Bitterfeld and RB thence to Lutherstadt-Wittenberg. H got to see Martin Luther’s door and the Black Bear provided excellent pork steaks! A fairly modest breakfast at the Acron but under the circumstances this was probably a good thing… Off to the station in good time for 0834 RB to Bitterfeld where a cross platform connection (RB again) took us to Leipzig. I missed the opportunity for a 5 minute connection on to an RE here and we had to suffer another interminable RB to Zwickau, with 22 intermediate stops. Disaster struck at Crimmitschau, not for the first time. 4 inutes late, we lost our path on the single line which still operates to Werdau. With arrival at Zwickau eventually 30 late we had lost hope for the 20 minute connection and were resigned to 1½ hours wait. Presumably due to the presence of a large group of football supporters the connection was in fact being held. 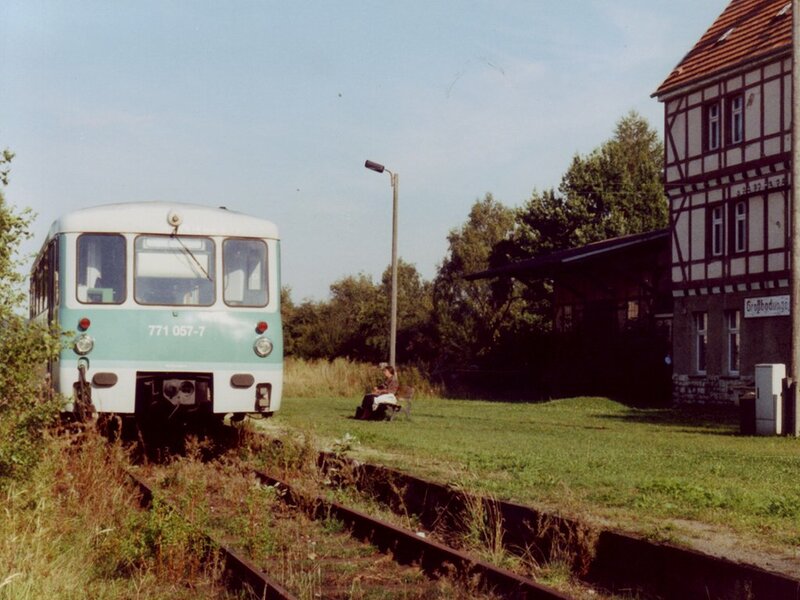 A contrast at Kraslice on 26.8.00, with the new Vogtlandbahn unit from Zwickau on the left contrasting with the (literally) flaky 810 566 belonging to CD but operated by Viamont, on the right. Away 13 late, therefore, in a frighteningly (to me, in poor health temporarily!) toiletless RegioSprinter for a 90 minute journey. The football supporters, who had been giving the beverages suitable attention, were suffering quite seriously by the time they decamped at Rodewisch. Fortunately the timetable allows 15 minutes at Falkenstein for the units to rendezvous and combine. The incoming (rear) unit from Herlasgrün was a few minutes late (or may even have been waiting in a siding so that our unit could lead as advertised in the timetable). Either way departure was more or less punctual, the Herlasgrün - Adorf unit dropped off again at Oberzwota and we arrived at Kraslice with ten minutes before the Czech train. Immigration was done after Klingenthal (German) and after the bridge (Czech). The bridge appears to be temporary with the new steel arch waiting to be rolled in from alongside. Look out for a short term bustitution! 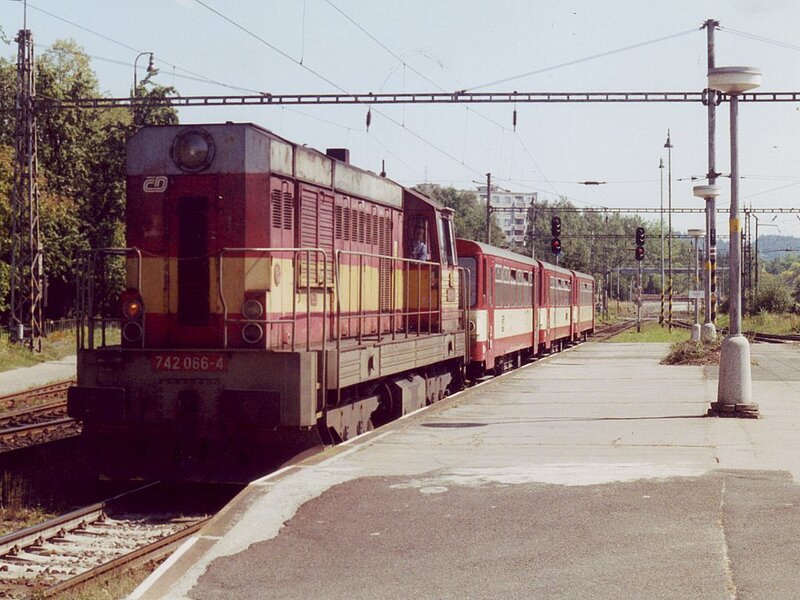 An immaculate 'Grumpy', 749 234, hurrying through Dalovice with a Cheb-Praha train on 26.8.00. Note the leading compo in the old plain green livery. Kraslice has some of the smartest loos in Europe - a princely CZK2 to use them! 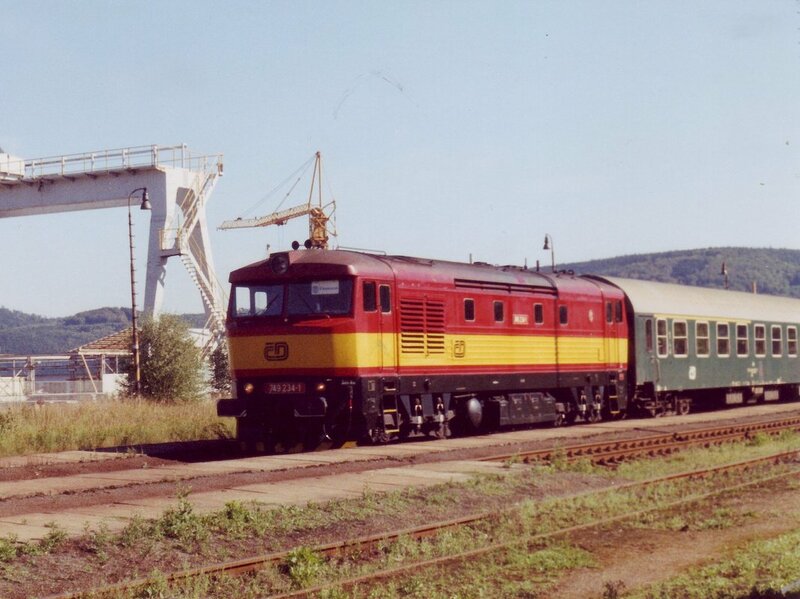 The Czech train was an 810 and a trailer with the wheelie bin running round as usual. They seem to be run by Viaform now, whoever that may be. Like the line from Falkenstein the run down to Sokolov is delightful - all the woods, streams and hills you could want. The karts arrived 10 early at Sokolov so we had 20 minutes or so to view Sokolov’s delights. Well, the station buff was open but with my still rather delicate state of health we decided against. Electric 242266 arrived on time with the Chomutov train which took us to Dalovice, changing to diesel at Karlovy Vary. In retrospect we should have changed at Karlovy Vary as there is nothing at Dalovice and we just had to sit for 50 minutes, during which one unit and one loco hauled train (749234 heading east about 1600) passed. 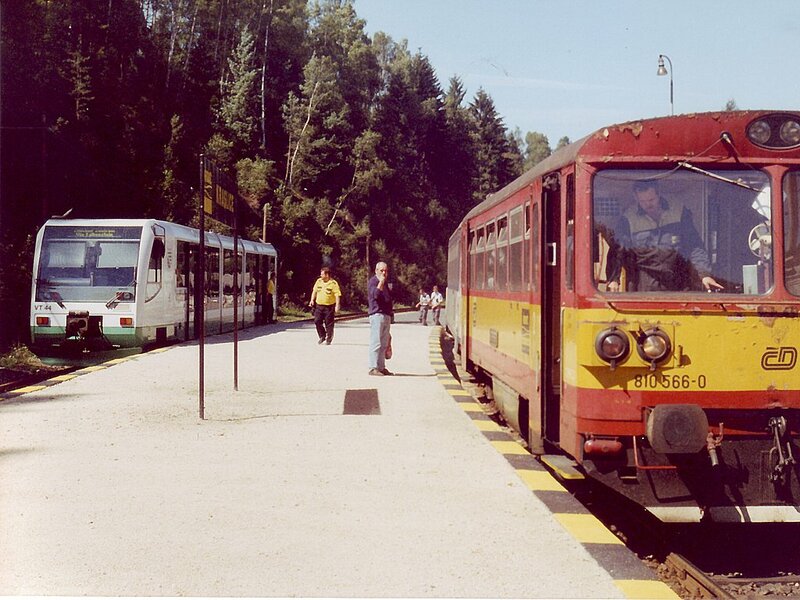 We'd been waiting at Dalovice for this Merklin train, seen here at the terminus on 26.8.00. The Merklín train was a single 810, quite well filled. The line itself has some wooded winding bits and some straight open bits, ending with a fairly strenuous climb for half a mile or so to Merklín. Merklín station was inhabited but very decrepit downstairs with all the windows out. Returning to Karlovy Vary we stayed with the few hardy souls venturing down to Karlovy Vary dolní nádraží where after a few enquiries a taxi was found to take us to the Pension Z [not its real name!]. Pension Z denied having our reservation, said he needed stamped forms, etc., etc., but he had a mate just along the street who would find us a room etc., etc. Yeah, right. His mate had only a shared bathroom room and looked thoroughly dodgy anyway, so we declined. 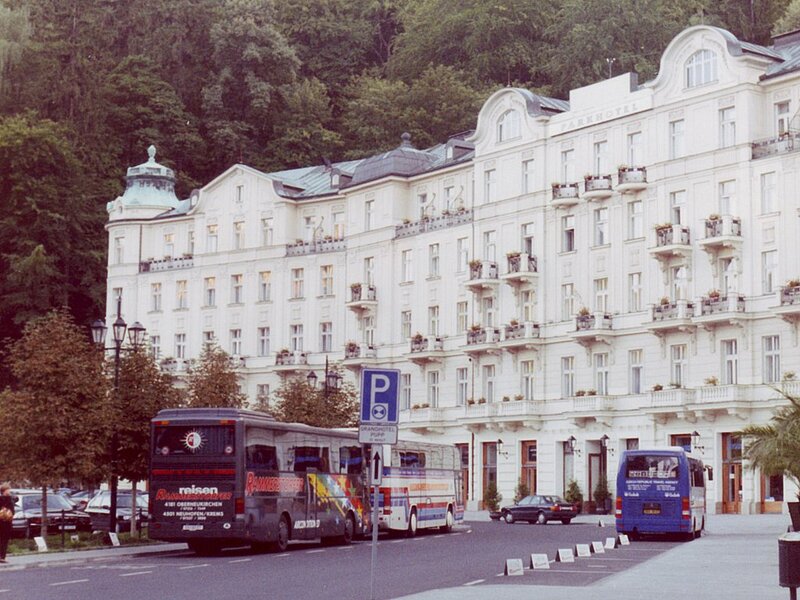 Karlovy Vary (Carlsbad to German-speakers) is a very untypical Czech provincial town, with some rather grand hotels. This one's the Parkhotel. While I went into panic mode with the timetable to find the last train from Karlovy Vary back into Germany, H persevered and found us an excellent room in an infinitely better hotel nearby (Promenáda). [On a summer Saturday evening I think this was beginner’s luck really. Most places around seemed to be full. Still, all credit to her for persisting!] This had a room in the corner of a galleried landing which looked down 2 floors on to the dining room. It was virtually a suite with an anteroom and an en suite bedroom. All in perfect condition, they charged us CZK1700 (about £29 at current rates). Out for dinner at prices low enough to be difficult for a Brit to believe, and then for a stroll round downtown K.V. which is a remarkable Czech equivalent of Bath. Well worth a visit, even if the number of unaccompanied young ladies with nowhere to go was a bit disconcerting. 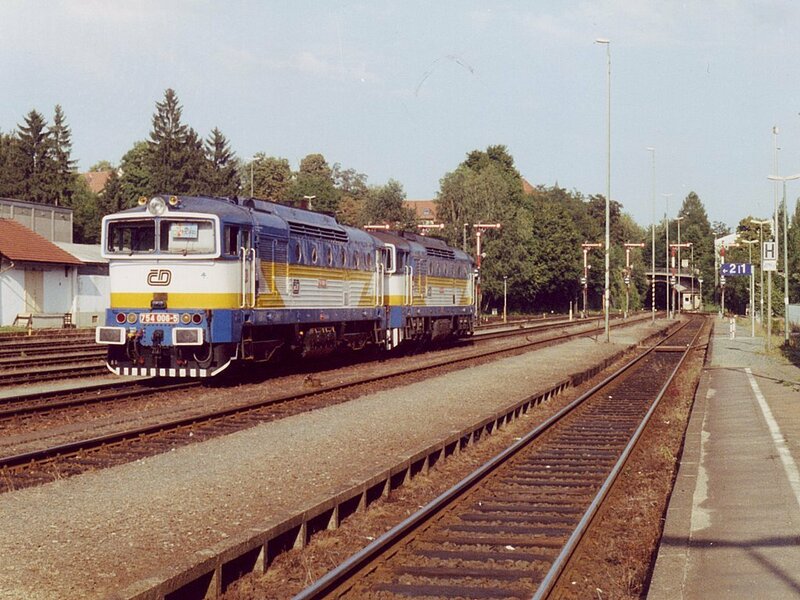 742 066 is seen here at Marianske Lazne (Marienbad to German-speakers) after arrival from Karlovy Vary (and running round its train) on 27.8.00. A standard German type breakfast rounded off a pleasant stay. 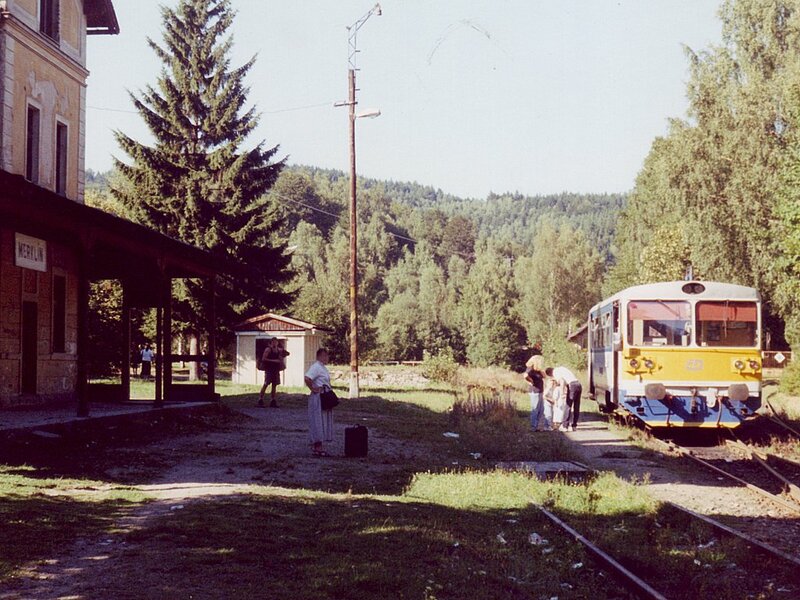 A taxi was obtained to take us to the station, where the 0923 to Marianske Lazne was 742066 and three wheelie bin trailers. A wonderfully picturesque run full of little stations in the middle of fields. Some of the stations appear to have significant timber traffic. The general alignment is up a lot, flat bit, down a lot with lots of curves. A couple of quite severe TSRs but on the whole the track seemed OK.
Marianske Lazne turned out to have a trolley bus service into town and after examining the timetable, H’s usual persistence established how the service worked. We repaired to (almost) the town centre - another spa town obviously very gracious at one time, along the lines of Karlovy Vary. Two Pilsner Urquells and a ham baguette later we returned to the station for the 1336 to Plana formed of 242239 and some disgraceful old main line stock. The little wooden hut on the platform dispensed Chodovar at around 25p/pint, and perfectly acceptable too. Plastic ‘glasses’ you could take on the train, so a very useful facility. 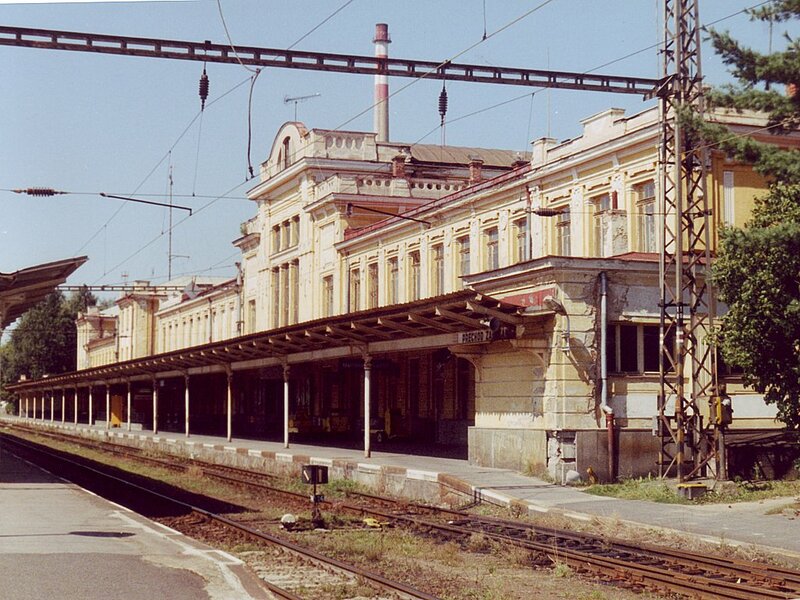 Marianske Lazne, another untypically grandiose town, has a station to match. The picture was taken from the south east (Plzen) end. A far more rural scene as our 810 pauses at Bor, on the way from Tachov to Domazlice via the quiet line 184. H had a few cross words with the gripper regarding our (perfectly valid) German SWTs but after an attempt to grip one of our EuroDominos he gave up and settled for the SWT. 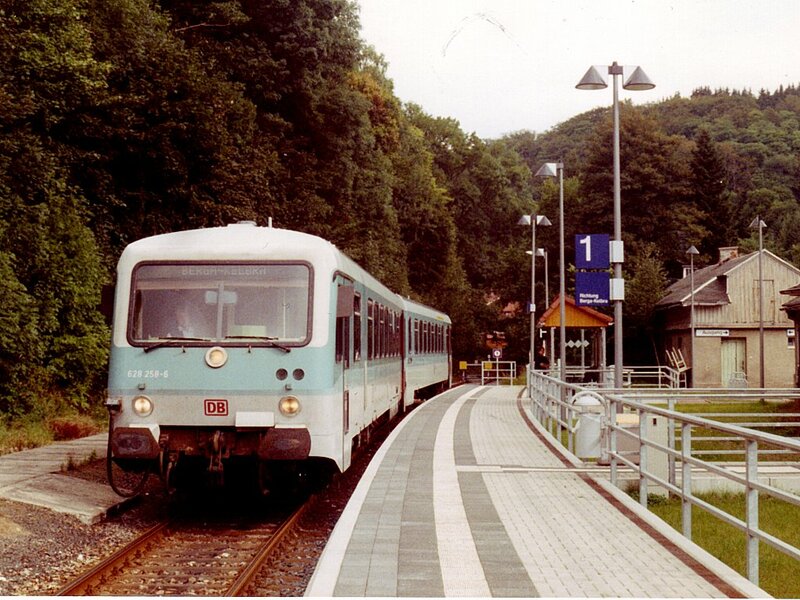 A cross platform change at Plana on to a single 810 for Tachov was followed by another at Tachov, for Bělá nad Radbuzou. This time the gripper was quite happy once told we were going to Furth im Wald. The kart from Tachov in fact ran right through to Domažlice despite suggestions in the timetable that you should change at Bělá nad Radbuzou. In real life we just did some shunting there to pick up a trailer. We dived out at Domažlice Mesto where the connection was 8 minutes – the shunting at Bělá nad Radbuzou had made us 6½ late at one point though this was almost all recovered. Another kart duly appeared to take us to Furth i. Wald. A pair of 'Goggles' (or should it be two pairs, or even four?) wait for the single line back to ČD-land at Furth i Wald's impressive array of semaphores. At Furth the border control staff were too preoccupied with a Polish rock band to worry about us. Back in DB-land it was onwards to Cham where the station buffet was in full swing and provided a beer but was too busy to commit to feeding us before the 1842 to Waldmünchen. A Regentalbahn single unit waits at the end of the line at Waldmuenchen, later to become briefly famous as the home of the 'Piano Man'. On return to Cham we had some difficulty finding a taxi but were eventually conveyed 3 miles or so to the Parkhotel which is a minimum budget (for the operator) Etap-type establishment where you key in a code at the door and your key appears down a chute. The allegedly open Bistro was shut, like the reception, but the Greek restaurant next door obliged. Draught Erdinger and a free shot of ouzo into the bargain. We gave a good account of ourselves in the Battle of Altenmarkt, but the mozzies won through sheer weight of numbers (and despite heavy losses inflicted by H who prowled the room armed with a local events magazine). By morning only one mozzie remained airborne but the damage was done, and we were sleepless and covered in bites. 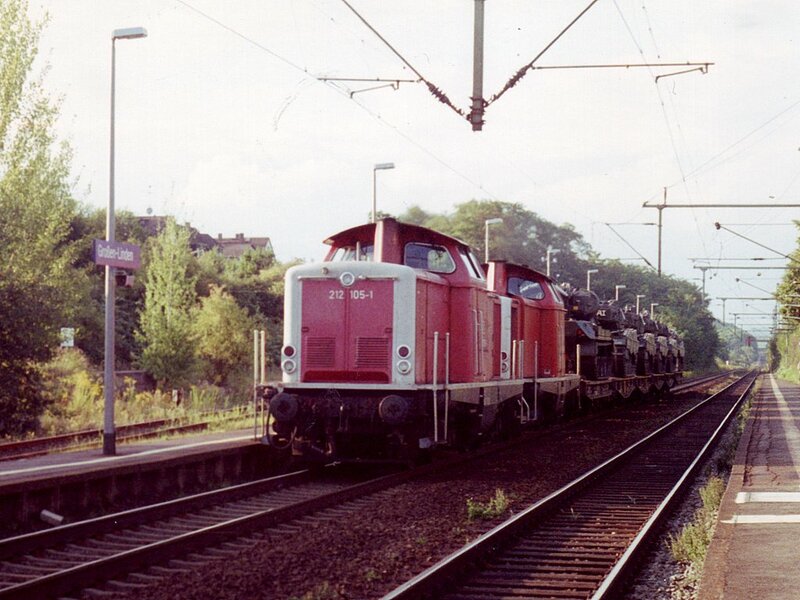 A pair of 212s, with 105 leading, hastening south at Großen Linden, near Gießen, with a short train carrying tanks. The hotel partly redeemed itself with a good breakfast and the taxi appeared at 0810 to take us back to the station for 0838 to Schwandorf, hauled by 218155. Schwandorf was reached late due to a late running eastbound train so we took the opportunity for a cash achine visit and an ‘early’ morning coffee/beer before continuing on 1006 to Marktredwitz with another 218. This was an interminable all stations RB which arrived on time at 1134. A 234 arrived with ČD stock from Praha, and then another (234072) on a Berlin-München IC, as we left for Nürnberg on a tilting kart. This delivered us on time and we had time for refreshments before departing on a crowded EC51 to Würzburg and thence a late running IC from Berchtesgaden which took us to Fulda, by which time it was 8 minutes late. 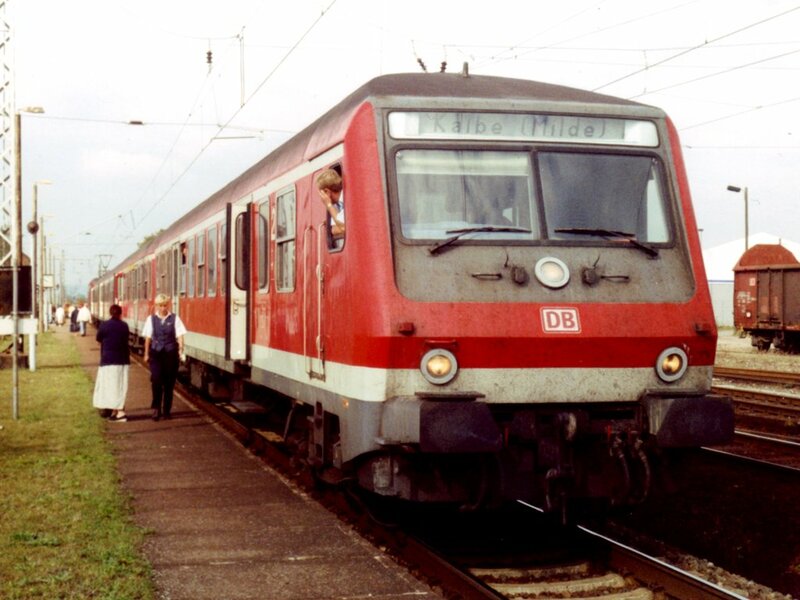 It was then mad dash time for the 215 powered 1533 to Gießen which we made by 30 seconds or so. This proved to be a fine line with some very nice timber framed buildings in the towns/villages along the way. The ‘Adler’ at Gießen turned out to be a hotel garni and pretty downmarket for its price, but at least it was only 100 metres from the station. A replan during the day had established that we could fit in the Gießen avoider so after a refreshment and pencil-sharpener-buying stop, we headed off on the 1803 to Großen Linden. Gricer's delight at Gießen as our train crosses to the freight lines in order to take the Gießen avoiding line on its way from Frankfurt to Wetzlar. At Großen Linden I completely failed to understand the departure sheet causing myself some concern in case the service was a) removed from the timetable or b) set down only. Deciding to busk it anyway, we went over to the other platform. Here a more reasoned appraisal revealed that the train splits at Großen Linden, front portion going forward at 1831 to Gießen and pints east, rear portion at 1834 to Siegen. So it proved, with the front train pushed and the rear one hauled, the two locos being together in the middle. The Gießen avoider itself was most satisfactory! We decamped at Herborn where the Hartenrod trains go [went] from a loop platform (5) so no real problem with the physical connection. Surprisingly the branch train was a blue/cream 215 with four coaches. We walked down into the town which is a very attractive and prosperous looking market town - just didn’t have enough time for a beer. Back at the station the Hartenrod train waited nearly 15 minutes for connections from Gießen and Siegen, with daylight very much at a premium (scheduled arrival at Hartenrod was 2022). In the event we arrived at 2035, just in daylight. I doubt the photo will be any good, but at least I tried! By 2045 when we left, the light had pretty well gone. On the way in, Hartenrod looked to be very picturesque – the station is on the eastern edge of the town and there is a good view from the train as it goes by on the side of the valley. On return to Herborn there was time for a beer this time, before the 2221 to Gießen. The selected pub was just closing but a nearby one obliged with Herborner pilsner. Cold and wet, which was the main requirement, but also very pleasant for its type. Ms I-really-think-I’m-something (more accurately, used-to-be), was of an all too familiar type! The 2221 was ex-Krefeld and had lost 10 minutes or so en route. The driver made very spirited efforts to get to Gießen on time - entertaining and partially successful. We were back in the Adler by 2300. Poor breakfast in the Adler, though a good night’s sleep. Wouldn’t bother again. 0810 Gelnhausen was an empty 2 car non-tilting kart. A very pleasant run it is too, though nothing too distinctive. The physical connection at Gelnhausen is OK. On to Frankfurt Hbf where the railway dross shop was visited, which left us just enough time to get out to Niedernhausen where a beer was partaken of, then back to Wiesbaden Hbf and thence by S-Bahn to Frankfurt Flughafen. The Airbus left the terminal on time but had to wait a while to take off and on approach to BHX it was sent off to orbit Honiley for a while. Arrival was therefore a little late but we caught a VWC via the reopened Proof House Jn into New Street and thence the 1705(ish) to Codsall where our son collected us after a restorative hot beef cob and Holden’s Special. With trackbashing now resumed, it was only 10 days before I set off again to Belgium, lured by (yet) an(other) ADL railtour, this time doing branch lines on the Dutch border.